Winter was uncharacteristically cold in our area this year, so we’ve got to experience almost real spring with warm rays of sun in cool air intervened by returning rains and cold spells. 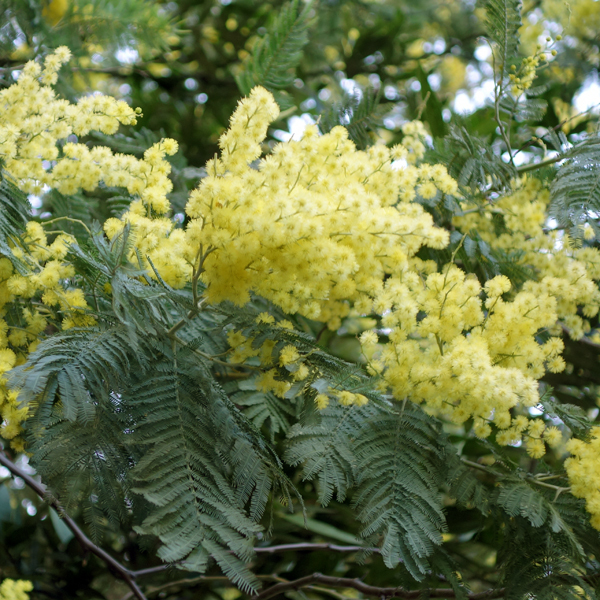 And since I was reminded of springs from my childhood, I got an urge to smell mimosa – blossom that used to encapsulate that time of the year for me. Over years (and five posts in my Single Note Exploration series devoted to that note) I accumulated enough mimosa perfumes to cover more than a week, but I decided not to overdo it. Jo Malone Mimosa & Cardamom is still one of my most favorite mimosa perfumes, though now I think that it is rather Fall than spring perfume: it’s too warm and spicy for the “life awakening” atmosphere. But I enjoy it every time I wear it. I think Mimosa & Cardamom was one of Jo Malone’s successes. When I was thinking about perfumes to include into this project, I struggled to remember the name for Frederic Malle’s mimosa scent despite having it in my collection. For a while I got stuck between En Passant (“No, it’s lilac not mimosa,” I kept telling myself) and Mimosa pour moi (“No-no, it’s L’Artisan, I finished that sample already”). Une Fleur de Cassie (I had to look it up) this time didn’t work for me: it was too dirty. I think I like this perfume better when it’s warmer. Once again I had a reason to bemoan the closing of Sonoma Scent Studio: Bee’s Bliss is such a sunny and joyful perfume with a nice prominent mimosa but with a lot more going on, it’s such a pity others won’t be able to experience it. … Fragonard Mimosa. A friend of mine shared with me recently a sample from her bottle. I’ve never seen or tried it before, so it was a pleasant discovery. Official notes are bergamot, violet, gardenia, mimosa, orange blossom, heliotrope and musk, but for the price it sells I don’t expect or get much of anything but mimosa, which, ironically, in drydown to my nose is a dead ringer to drydown of Infusion de Mimosa. And since I do not suspect Prada in using too many natural ingredients, even at their price, I wouldn’t be surprised if it actually was the same aroma chemical. What does surprise me is thatt Givenchy Harvest 2007 Amarige Mimosa still impresses me every time I wear it. Unlike many other old favorites that just evoke nostalgia, Amarige Mimosa is perfume that I enjoy wearing… whenever I remember to wear it. Rusty also looks somewhat surprised. The last perfume I wore for the project was Atelier Cologne Mimosa Indigo: it’s a nice perfume with a good name quite fitting the topic, and in the end of the Mimosa Week I especially enjoyed wearing it since, to my nose, it doesn’t smell of mimosa (or of lilac to that matter). Interestingly, saffron in this perfume doesn’t bother me and works nicely with the soft leather and not too sweet vanilla. For a while I was collecting DVD. My rule was to buy only those movies that I watched, liked and wanted to have in my collection. 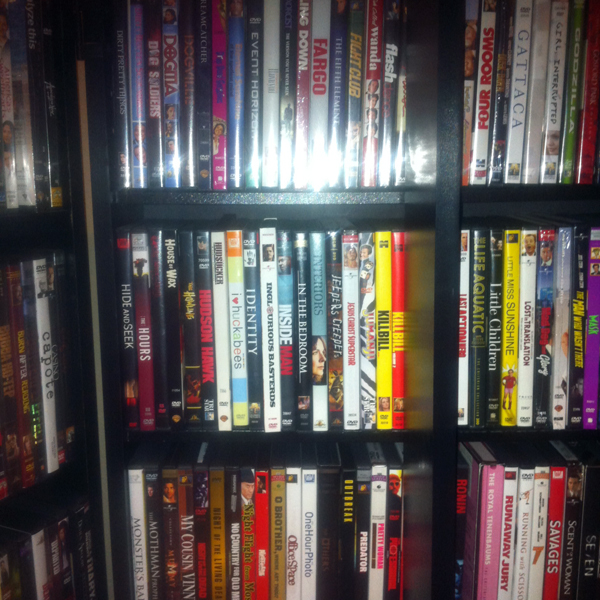 What I noticed over time: once a movie got on the shelf I would rarely watch it again. I would still like the movie, think it is great and even watch a big chunk of it if I would catch it while switching TV channels, but whenever choosing what to watch, I would almost never go for a DVD I own. Recently I came across an interesting project – Found in Translation. A graphic designer Anjana Ilyer creates posters to illustrate words in other languages with no direct English equivalent. 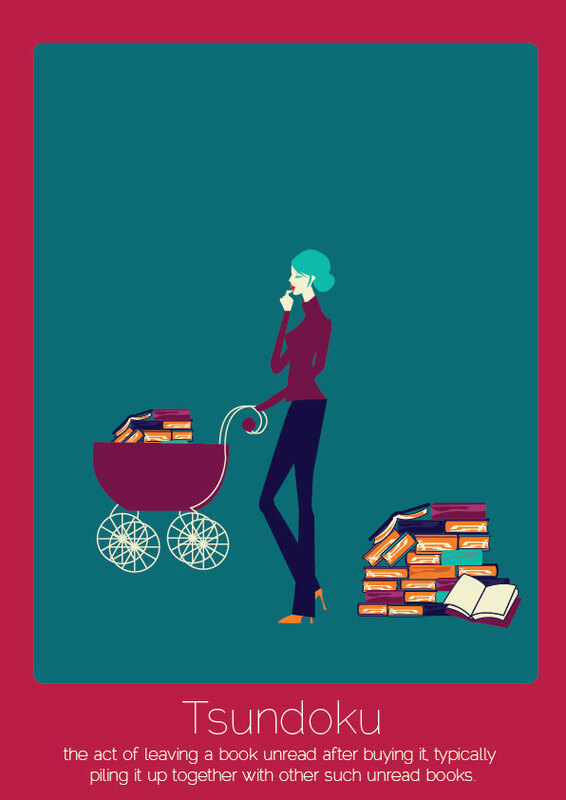 One of the words that grabbed my attention is similar in spirit but describes a different medium: Tsundoku – a Japanese word that means “the act of leaving a book unread after buying it, typically piling it up together with other such unread books.” I’m guilty of that behavior with the only difference: the books I buy and plan to read go directly on a shelf in my bookcase. Why should it be different when it comes to perfumes, right? I have a number of bottles in my collection that weren’t impulse buys – I tried them, liked and even hunted some of them; I didn’t get tired of them and do not consider them albatrosses – and still whenever choosing what to wear I pass them by and they spend most of the time just sitting on one of the perfume shelves in my closet. 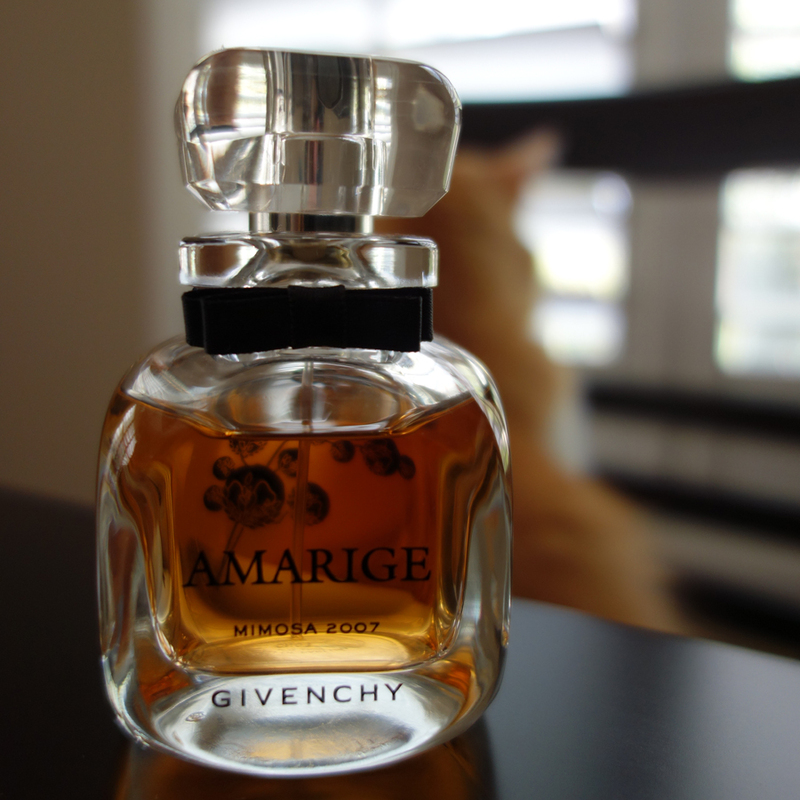 Amarige Harvest Mimosa 2007 by Givenchy is one of those “tsundoku” perfumes. I tried it first at some duty-free store at the airport and liked it. I got a sample and as it was nearing the end I liked it more and more. 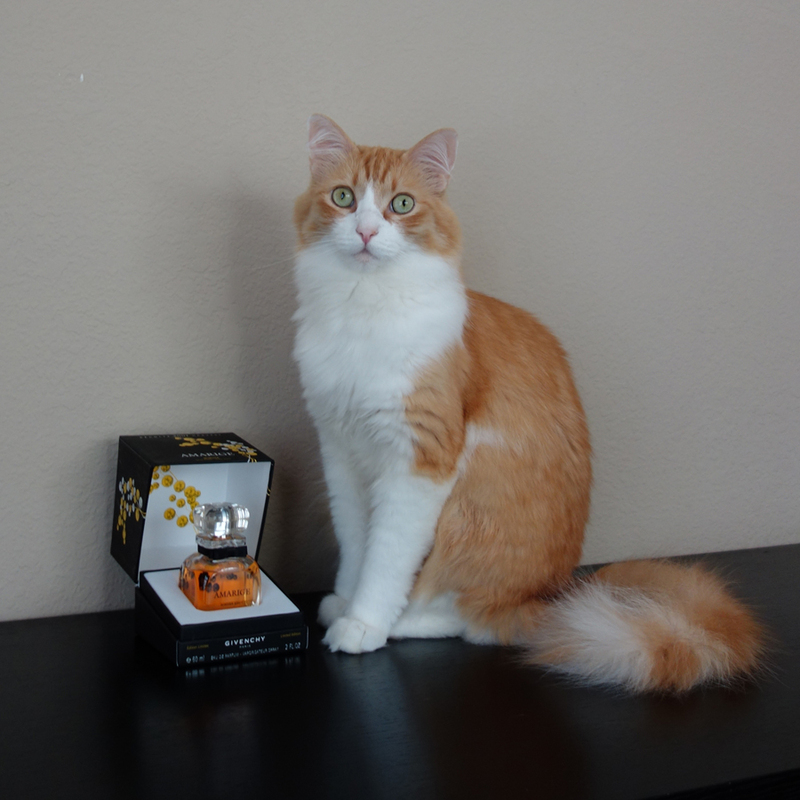 By the time I decided I wanted Amarige Harvest Mimosa, being a limited edition, it was gone. But I was persistent and eventually a very reasonably priced bottle joined my collection. I still think it’s great and I’m glad I have it but the last time I wore it was while writing the post about mimosa-centric perfumes… three years ago. Since then it has been safely stored all the way back on the perfume shelf. For notes and actual review read The Non-Blonde. Images: poster by Anjana Ilyer; two other – my own. In the nineties my perfume adventures were limited by what mass market ladies’ counters had to offer. But since there were much less new mainstream releases back then, usually after getting familiar with everything available for the appropriate gender I would entertain myself sniffing what was offered to gentlemen telling myself that my vSO might need one more bottle (as if he was running out of those four or five I’d previously persuaded him he would love). One day while smelling new masculine releases I suddenly found myself drawn to one perfume. π (Pi) by Givenchy – created in 1998 by Alberto Morillas, notes (according to Fragrantica) include basil, rosemary, tarragon, mandarin, neroli, geranium, lily of the valley, anise, vanilla, tonka, cedar, benzoin, almond and yellow sugar. I liked it. Not for my vSO – for myself. I kept going back to the counter to try it again and again. It felt strange because, in my mind, there was supposed to be a strict distinction: feminine perfumes, masculine colognes and some new trendy creations called unisex (but those that I’d come across then were neither fish nor fowl). One day an SA struck a conversation with me and I admitted that I was thinking about buying it for myself. I don’t think she whispered but she definitely lowered her voice when she told me, in confidence, as if it was something about what people do not talk out loud, that many women like masculine perfumes. What was more important, she gave me a couple of samples of Pi. When the samples were gone I bought a bottle. I think it was my way of breaking out of the habitual floral perfumes I used to favor (and probably still do). I wore Pi Eau de Toilette pour Homme reveling in my eccentricity and fearlessness. I think I liked not as much the perfume itself but that feeling of dare. And then we just grew apart. I didn’t suddenly start disliking Pi – I just didn’t feel like wearing it anymore. Last year a friend of mine whose birthday is today, March 14th (M., if you’re reading this – Happy Birthday! ), told me about that day being known as a Pi-Day. I’ve never heard about it before: having grown up with the European date system I’ve never seen the connection between 14/03/YY and number Pi. It was too late to do anything last year but I told her that if I would still be blogging in a year I’d write a story about this perfume since I kept this bottle for the last ten years. And I would have missed it again if it weren’t for her reminding me. 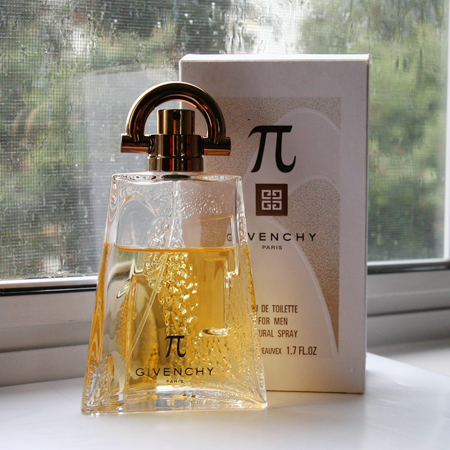 So here’s my Pi-Day story about Pi – the first masculine perfume I bought for myself. Now it goes into the Retirement Box. I haven’t found any real reviews. Either it was really that bad or at least it wasn’t good enough for anybody to contradict Luca Turin’s disparaging comment in the Guide. Do you remember your first perfume that crossed the gender line? A gray chilly day, gray dirty slush on the pavement, gray skies and serious men in gray gabardine overcoats with gray newspaper cones – in their hand, under arm or even sticking out of a handbag. And confined in each of those cones are hundreds of small suns. This is how I remember 8th of March, an International Women’s Day, from my childhood. 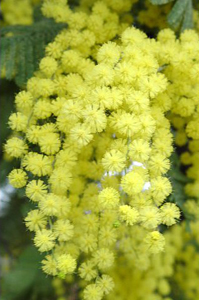 Of course, there were other early spring flowers – tulips and daffodils (back then we didn’t have “evergreen” roses yet) – but mimosa* was strongly associated with this holiday (a combination of Mother’s Day and St. Valentine’s Day). Mimosa was such a sunny and happy flower that you couldn’t help feeling Spring in the air even though it was still cold and unpleasant outside. It’s almost never cold where I live now; all seasons’ boundaries are blurred and I gladly swapped not so “international,” as I found out, holiday for a more romantic, in my view, local one. But I still smile and my heart fills with joy whenever I see these bright golden constellations on a filigree of silvery leaves.